(Opening) The Nellie, a cruising yawl, swung to her anchor without a flutter of the sails, and was at rest. The flood had made, the wind was nearly calm, and being bound down to the river, the only thing to do was to come to and wait for the turn of the tide (5). The above passages open and close one of the quintessential novels (and works of art more wifely of the 20th century. Heart of Darkness by Joseph Conrad. This is just one of many very striking examples of the use of tides in literature, where they are used as symbols of beginning and ends of narratives and of departure, climax and resolution. Given the great power and spectacle of many tides, their mysterious nature, and the way they influence day to day life and landscape so significantly, it is no surprise that tides feature heavily in a range of cultural manifestations which include folklore, myth, literature, poetry and art. The way tides are used as a metaphor, and are built into a range of narratives, varies from them and their significant moments being a symbol of renewal , to being a symbol of threat, loss and dread. There is inevitably a huge variation in how this plays out in differing cultures around the world. Here I draw out just some of the most interesting and important examples (as I see them) of tides in this way from what are inevitably my own cultural location. Of course folklore in some senses precedes ‘literature’ or forms the earliest manifestations of literature so best start there. As mentioned in chapter 2 tides were deeply mysterious things to ancient and even medieval cultures. Lacking an understanding of gravity, there was no clearly graspable reason why the seas rose and fell. The many cultures who observed the passing of the seasons and phases of the moon had some sense that tides were part of a divine cosmic order but only in some complex obscure sense given their great variation in form and rhythm. In the vacuum of a scientific, or at least practical grasp of ebb and flow various cultures derived their own tide creation myths. One notable example of tidal genesis comes from the Norse tales. In one collection of stories, The Prose Edda, there is a tale of the god Thor being challenged to a drinking contest by the giant Utgarda-Loki. Thor drinks from his horn with gusto, but despite his best efforts cannot drain the horn. He had been tricked; the giant has connected the horn to the oceans, so Thor was in fact trying to “drink the seas dry”. 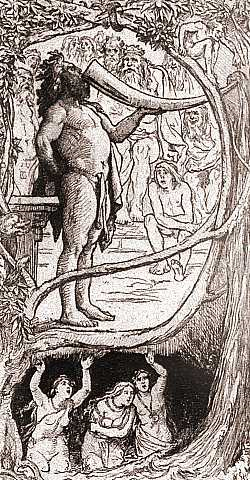 The giant mocked Thor for his weakness. But from then on, so the legend goes, the seas rose and fell each day in an echo of the valiant efforts of Thor to complete an impossible task. Thor is tricked into trying to drink the sea and thus creates the tides. Sir James Frazer, in the famous twelve volume work The Golden Bough which recorded folklore, religious beliefs across cultures, summarized a number of folkloric attitudes to the tides. 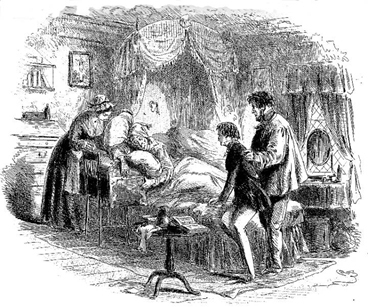 From Shakespeare to Dickens, such beliefs cropped up in dramatic narratives, as in the death scene of Mr Barkis in Dickens’s David Copperfield. Barkis, an old seafaring man, lingering on his death bed in a house built of old ships planks (check), located on a beach on the South coast of England, finally dies when the tide is on the ebb. “I find Mr. Barkis “going out with the tide” by Phiz (Hablot K. Browne). February 1850. Steel etching. Illustration for chapter 30, “A Loss,” in Charles Dickens’s David Copperfield. Source: Centenary Edition (1911), volume two. The belief that most deaths happen at ebb tide is said to be held along the east coast of England from Northumberland to Kent. Shakespeare must have been familiar with it, for he makes Falstaff die “even just between twelve and one, e’en at the turning o’ the tide.” We meet the belief again on the Pacific coast of North America among the Haidas. Whenever a good Haida is about to die he sees a canoe manned by some of his dead friends, who come with the tide to bid him welcome to the spirit land. “Come with us now,” they say, “for the tide is about to ebb and we must depart.” At Port Stephens, in New South Wales, the natives always buried their dead at flood tide, never at ebb, lest the retiring water should bear the soul of the departed to some distant country. Now of course all this seems very fanciful (as Frazer suggests), but as discussed in chapter 6 tides do seem to have palpable effects on living bodies. Could there be something going on here? Some effect the tide is having on the brain and/or body and the energies therein? The great American poet Walt Whitman, when visiting American Civil War hospitals in Washington (US), in the 19th century, felt that the wards, and the seriously wounded in them, became calmer, “and died ‘easier’”, in harmony with the tides (see Raban, 1992: 474). Other writers have referred to how the gender of livestock can be influenced by timings of animal copulation in relationship to the moon and tides (e.g. Ticknell, 1951). The implication is that you have to ‘seize the moment’ in politics, war and other endeavours, just as those seeking to set sail from tidal harbours (or entering them) have to catch the rising tide or otherwise wait for another opportunity. (In terms of sea-bound trading – missing the tide could be costly in both the short and long term). it approaches its food joyfully. as the flood had been. One of the great powers the tides have symbolically is the sense that they are a restless, tides is the sense that they are a ceaseless, endless cycle. They, for sure, will continue on past any human aspiration of moments of life As in this poem, this there is not only a comparison with the waning of youth, beauty, vitality and sexuality with the ebb of the tide but also a sense that the human ebb is a final one – not to be repeated of the brevity and finitude of human fortunes. That the power of the seas and their tides were often considered to be way beyond the fortunes of ‘men’ is illustrated by the common mythical story in British culture of the ancient king Canute who, depending on which version is in play, sought to prove the limitation of his powers to his deluded minions by t seating himself in the margins of the sea and letting the tide rise over him. 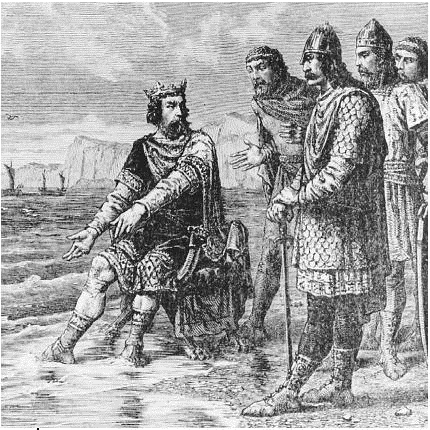 Although some versions of the story have it that he was trying to prove him power over the sea itself. The opening quotes at the top of this chapter shows that the telling of the dark tale that forms Joseph Conrad’s Heart of Darkness takes place on yacht in the Thames Estuary and is set between the turn of two tides. The liminal margins and spaces between the land and the sea, as articulated by the time-space rhythms of the tides area key motif in Conrad’s form of psychological realism; two sets of his short stories being entitled Twixt Land and Sea and Within the Tides. A number of other novels open, and even also close with, a reference to the tide. Examples being The Mill on the Floss, George Elliot; Frenchman’s Creek, Daphne du Maurier; The Sea, The Sea, Iris Murdoch; The Highest Tide; Jim Lynch; The Sea, John Banville. Our Mutual Friend- Charles Dickens; Glister – John Burnside; The Snow Goose – Paul Gallico; and in travel/place writing The Kingdom by the Sea – Paul Theroux; Coasting – Jonathan Raban. I am sure there are many more. In such literature, high and low water are used as symbols of beginnings and ends in narratives. The turn of the tide is used to locate ‘us’ and our stories in time – to mark a point where things can start, and things can end. This reflects a need (perhaps) not only for human stories to embed themselves in (patterns of) space and place, but also in patterns (rhythms) of time. Just as landmarks and objects can be significant in terms of places (e.g. prominent trees – see Harrison, 1991) then moments and periods such as low tide, high tide, rising and falling tide, can become markers of the lived flow of time. The turn of the tide act as dramatic pauses, even lacunae, in which the weight of the narrative itself can be felt as a piece. Beyond the obvious (anti)climax of death, novelists use tides, particularly the Spring tides as psychogeographical moments of narrative climax. Two examples are John Banville’s The Sea, and David Lynch’s , The Highest Tide. In The Sea the narrative as memoir takes an elliptical form where the dramatic, tragic denouement of the story, which takes place at an exceptionally high tide, is anticipated in the opening lines. In Lynch’s The Highest Tide the opening of the narrative is a discovery made by a boy while exploring intertidal land at a very low tide. The ebbing and flowing of the tide is woven into the following story. And like Burnside, but in a more optimistic note, Lynch uses an exceptionally high tide to mark, and contribute to, the resolution of various strands of the story in the denouement. In a sense the use of tides in such works about life beside the sea is unsurprising, this is precisely because it is such a monumental force! There is a very obvious and literal way in which intertidal space feels new after the inundation of the last high tide. On the sandy seaside beaches of Tenby and so many other resorts, the footprints, the sand graffiti, the sandcastles, even the litter of one day are obliterated by the tide to leave the beach pristine again on the morrow. I was walking by the Thames. Half-past morning on an autumn day. Sun in a mist. Like an orange in a fried fish shop. All bright below. Low tide. [ ] Thames mud turned into a bank of nine carat gold rough from the fire [ ] I swam in it. I could not take my eyes of the clouds, the water, the mud. these places seem to have a very particular power. This lies in the sense of freedom that beaches offer, their sheer openness, and the novelty of the life they support… They are places that literally have a life of their own, where rhythms of tides and seasons set an agenda that seems to stand outside human time (1996: 2/3). And they have also used the beach and the flotsam and Jetsam the tide delivered on ‘the tide line’ a recent notable example being . Jean Sprackland’s book . Strands A Year of Discoveries on the Beach, which spins out a number of interweaving narratives which start with a discovery on the beach encountered on her walks. A series of meditations prompted by walking on the wild estuarial beaches of Ainsdale Sands between Blackpool and Liverpool, Strands is about what is lost and buried then discovered, about all the things you find on a beach, dead or alive, about flotsam and jetsam, about mutability and transformation – about sea-change. But tidal areas can be dark (haunted) landscapes – perhaps reflecting and amplifying the psychological states of whatever protagonist is driving the narrative . Peter Grimes by George Crabb; poems by Silvia Plath e.g. Mussel Hunter at Rock Harbour; The Women in Black by Susan Hill, all make tidal spaces darker spaces. The draining and creping tide, and the unknowableness and openness of often vast intertidal landscapes can be a spatio-material medium for feelings of angst, threat, fear and dread. In Crabbes’ narrative tragic poem Peter Grimes the tidal marshes become a place of isolation and desolation. In its hot slimy channel slowly glide (cited in Drabble, 1979: 73). Mussel Hunter at Rock Harbour, and found raw, visceral space. Mud stench, shell guts, gulls leavings. Beyond such dal landscapes have featured in novel about foreign threats to British sovereignty as in The Riddle of the Sands by Erskine Childers and The 39 Steps by John Buchan. (In the latter the key to the mystery is a flight of dock stairs which at a certain high tide has 39 steps exposed).